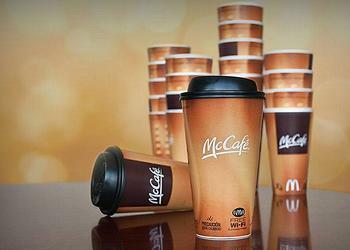 OAK BROOK, Illinois, September 26, 2013 (ENS) – McDonald’s Corporation, the world’s largest fast food franchise, will replace polystyrene foam hot beverage cups with paper-based cups at all its 14,000 U.S. restaurants. The company confirmed this change to the California-based nonprofit As You Sow on September 24 after nearly three years of engagement with the advocacy group, which works to persuade companies to adopt sustainable and equitable corporate practices. “We congratulate McDonald’s on its decision to stop using foam beverage cups, which will reduce the threat of plastic pollution to the world’s oceans and provide a more recyclable, valuable alternative in paper fiber,” said Conrad MacKerron, senior vice president for As You Sow. Polystyrene is not widely recycled and has become pervasive in the marine environment, carried through storm drains to the ocean. It has been cited as among the most common debris found on beaches. Polystyrene breaks down into small indigestible pellets which animals perceive as food, resulting in the death of birds and marine mammals. Forty-six cities and counties in California have banned or restricted the use of polystyrene food packaging. The production of styrene, a component of polystyrene, carries occupational safety risks. The International Agency for Research on Cancer determined that styrene is a possible human carcinogen. In 2009, the California Office of Environmental Health Hazard Assessment proposed that it be listed as a known human carcinogen. Several epidemiologic studies suggest an association between occupational styrene exposure and an increased risk of leukemia and lymphoma. In 2011, As You Sow offered a shareholder proposal that asked McDonald’s to consider stronger environmental policies for its beverage containers, such as setting recycled content and post-consumer cup recovery goals; 29.3 percent of their investors supported the resolution. Following that high level of investor support and continued work with As You Sow, the company unveiled a new pilot program in March 2012 replacing foam with paper cups at 2,000 of its U.S. stores. The company tested double-walled fiber hot cups at 15 percent of their stores, primarily on the West Coast, for consumer acceptance, operation impact, and overall importance. In 2012, As You Sow withdrew its resolution due to this concrete step towards phasing out of styrene foam-based cups and other planned company actions. Now, the company has confirmed that the pilots were successful and that it will phase out foam cups at all locations in the coming months. Paper cups also use significant energy and chemicals in their production, but do not persist in the environment for hundreds of years, as foam does, and are becoming more readily recyclable. MacKerron said that while this is a great first step, there is more work to do for the company to have a comprehensive packaging recycling policy. As You Sow points to Starbucks, which uses 10 percent recycled paper fiber in its paper hot beverage cups. Starbucks has committed to recycle all post-consumer paper and plastic cups discarded in company-owned stores by 2015. It offers a discount for customers who bring reusable beverage containers into stores. McDonald’s is moving towards more environmentally-friendly food and beverage packaging with the help of environmental groups. The company is one of the largest purchasers of recycled paper, used in food containers, bags and napkins. Environmental Defense Fund worked with the company to phase out polystyrene foam-based clamshell food containers in the 1990s. However, the company continued to use billions of polystyrene-based beverage cups. Still, the collaboration with EDF gave rise to nearly 40 additional programs and partnerships with McDonald’s over the years, which have resulted in progress on a range of sustainability issues. An average of 99 percent of all McDonald’s animal handling suppliers have passed their animal welfare audits over the last three years. More than 4,000 audits have been conducted in the past 10 years. Every animal handling facility in the McDonald’s supply chain is required to be audited annually. More than 98 percent of McDonald’s whitefish originates from fisheries with favorable sustainability ratings as a result of McDonald’s partnership with Conservation International to develop its sustainable fisheries program. McDonald’s developed its Supplier Environmental Scorecard with Conservation International to measure and reduce water, energy, air, and waste impacts in its supply chain. The scorecard is currently being used by bakery, beef, poultry, pork, and potato suppliers in the company’s nine largest markets.